We started the archery shop in 1995 to provide equipment and service to the local 4-H Shooting Sports, archery clubs and local bow hunters and it has grown from there. We provide personal service to our customers: compound and traditional bow setup and repair service, shooting instructions, custom made arrows(aluminum, carbon & wood), custom made bowstrings & cables and carry a large selection of archery accessories. We can special order most items that our customers want. 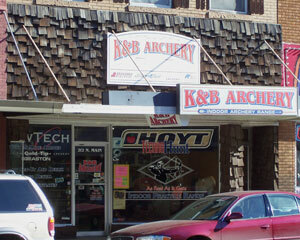 K & B Archery has a 20 Yard Indoor Practice Range and also a Computerized Interactive Techno Hunt Shooting Range that we run leagues on from Oct thru April.